This past week was a difficult one for me. I am close to finishing my book and wondering how my Word Babies will be accepted by the world. Will people buy my book? If they do buy it, will they like it? What if it gets ripped apart in book clubs? What if it doesn’t get published at all?! This morning I boarded a ferry to Lummi Island to spend part of the day writing at the Beach Store Cafe. It’s the perfect place to grab a chair by the window and let those worries recede into the waters of Hale Passage. Sitting here and reading over my manuscript, I am reminded that I write because I love writing, not because of finalist ribbons or promise of where my Word Babies will travel. 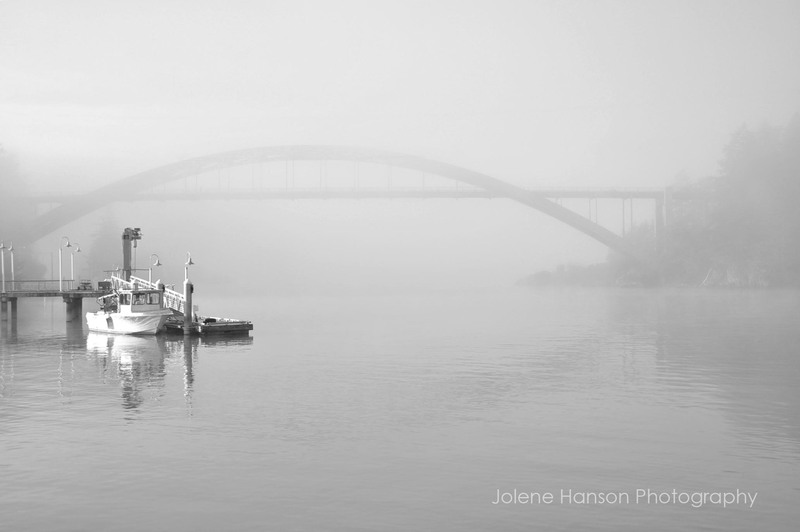 Writing is like steering a boat through fog. I don’t know if the waters ahead are smooth or turbulent. I don’t know if I’ll even find the shore or how long I’ll be sailing. But, I keep moving forward. What’s the alternative? To stay docked? I am assured that all writers have doubts about their craft. Does anyone else out there worry so much about things that haven’t even happened? I’ve been in these shoes. Having the ribbon at the conference is a nice boost. Agents and editors DO notice, at this conference they even have direct access to your submission in a separate room for their review. Remind yourself that a ribbon is just as much about who the judges were, who else entered the contest, and the structure of the rubrick as it is about the fabulous nature of your work. If you get one, its a great bonus, and if you don’t, you’ll just have to impress agents and editors another way. No matter what happens, congratulations to you for almost finishing your manuscript and for having the courage to share it. Thank you for your encouragement, Lorraine. I did notice your name on the Pacific Northwest Writer Association member list. Are you planning on attending the conference this summer? We should get together and talk writing again soon. I worry all the time. Sometimes I fantasize and think my books will be best sellers. The rest of the time I despair, thinking they’ll never even sell. But they will. Yours will. It’s the old cliche about the squeaky wheel: pester enough agents or editors with a good book and they’ll bite! Maybe we should worry less and write more, Ann? Hard do do. But, you are right – our books will be finished, and one day they will sell. The photograph is painterly and as it is my wont to linger in foggy daydreams, I’ll stay and admire it a little longer. As to the book, felicitations for having undertaken and nearly completed such a daunting task. I am awed. By way of saluting your infectious attitude, I’m taking the unusual step (there is no protocol in these matters) to award you the imaginary though powerful “I haven’t read this book yet but already love it” cup. May drinking from it inspire you to always write with joy (as in the joy, for instance, of indulging in the alchemic pleasure of splitting infinitives). I am inspired by your confidence, and I accept your imaginary award. It’s far better than any arbitrarily assigned ribbon. (And to boldly split whatever infinitives I desire – what fun!) Thank you for a dose of literary magic in my morning. I think the anxiety is part of the creative process. You have to open yourself up and that isn’t easy. I feel that way when I put my photos out for the world on the blog, and have had the same sort of worries now that I’m thinking about publishing the photos in other forms. A little anxiety is good IMHO, it shows that you care about what you’re putting out there. And I like the photo – makes me miss the Northwest. And when I see your photos, Mike, I get the wanderlust! I think you hit the nail on the head – anxiety shows that you care about what you’re putting out there. So, I’m normal? ha. I do hope you compile your photos into a book. If you hit the East Coast, you’ll have covered the entire continental USA. Good luck with the book Jolene. I have a million shots of that bridge, non better than this. So enjoying the photos and musings. Look forward to buying at least two books. One for me and one for friend. That’s very sweet. 🙂 Thank you, Susan! Love the mood, the composition, and the lighting, exceedingly well done! Good luck with the book too. I think I make photographs for the same reason you write. I’d really like to earn my living with my camera one day, and I love it when people love it, but I photograph because I need to. I do it for me. Thank you, Jeff. I think that’s a sure sign you’ve found your calling – photographing simply for the love of it. Thanks for visiting! Thank you – I am hoping a publisher will want to couple my writing with images. I have lots to chose from! Very beautiful shot! Good luck w the book! I totally feel this way all of the time. Rarely do I remember that I love writing–mostly I think about how much I’ll love the attention and recognition. Thanks for your honest insights! Thank you, Pam! By the way, I enjoyed your book review. I’m heading over there to comment…also, I want to borrow that book. Sounds fascinating. That is a beautiful shot. When did you take it? I’m trying something new today: writing at home! You are amazing with or without ribbons. But I will make you one if I need to and you can wear it everywhere!